The exact timetable for the introduction of Linky is not crystal clear yet, but ERDF tries to provide some transparency with a special website. There was a special section on this website where you could fill in the 14 digit code of your Point de Livraison (PDL}, to be found on your EDF facture. To get some indication of their timetable. Perhaps I didn't try hard enough, but this service seems to have disappeared. Perhaps a bridge too far because of all the delays. There is now only a general statement: you will be informed in advance. This is what the ERDF has to say: "Au moment des opérations de remplacement, chaque client recevra à l’avance un courrier l’informant de la date à laquelle ERDF interviendra. 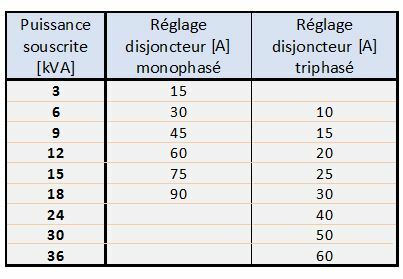 Un numéro spécial sera ouvert au public et tous les renseignements nécessaires seront mis en ligne en plus des explications remises au moment de la pose (voir notices en bas de page)." 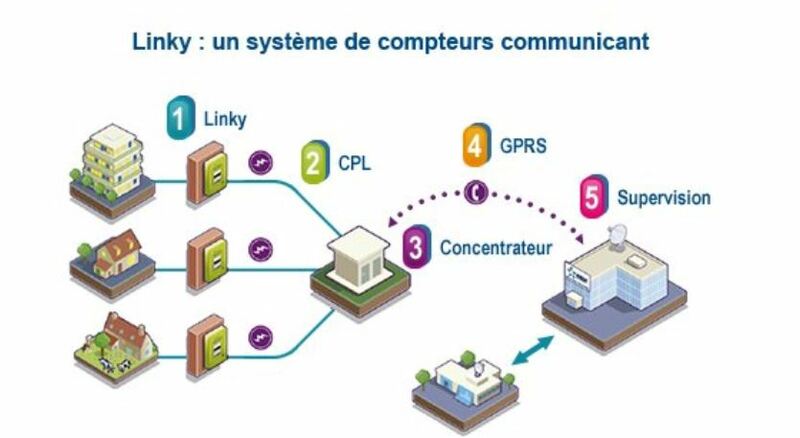 About the communication possibilities of Linky: it is supposed to talk with CPL encoding, using your electric cable to a so called concentrateur in your local substation. And from there through the air (GPRS) to headquarters. Only one minor problem: most of this telecommunication infrastructure is non-existent at this moment. The not-so-smart-meter approach, le faux compteur intelligent. Timetable forecasting, personal opinion: Brussels has set 2020 as the finish line for the EU memberstates. In a (desperate?) effort to get somewhere in the neighbourhood of the EU target, 80% level of implementation, the ERDF/EDF will start with the cities, and probably not with far away villages and lieu-dits in the countryside of la France profonde. Are you being served? My guess is that it will take several years before mr postman brings you the promised ERDF/EDF letter. As long as you belong to a species of mankind generally referred to as " campagnards". New minister and the same old song. Mrs. Ségolène Royal, la ministre de l'Écologie et de l'Énergie, wants to speed up the introduction of the new smart meter, so she told the audience of this ERDF conference about the smart power grid. Do you remember? To help you, dear citoyen to control your energy usage and save money. With the help of little digital servants, communicating real time between your meter and ERDF headquarters. Five days before this event took place, a committee report has been presented to the French Assemblée nationale. An evaluation of the 2008 climate policy measures (le paquet « énergie-climat »). It starts with a summary in ten key points. Under the fifth point, how to reinforce the information to the citizen, there is an old friend, our mr. Linky. Some critical notes: using this smart meter the ERDF will provide you only with aggregated data over weeks or months. If you want a more regular and precise feedback, you'll have to pay for it. If the ERDF gets the communication infrastructure in the air in time....Installing these meters is one thing, embedding them in an effective communication network is step two. Old fashioned solution: old meter + paper + pencil and take some notes every week. Several years without real new developments here in France. But there might be an input for the ongoing debate. Last week the University of Twente in The Netherlands published an interesting study about the measuring behaviour of smart meters. For the English speaking research world and for those who find it difficult to understand Dutch (or Chinese) there is a press release in English. The readings of several smart meters are – in certain conditions – sometimes much higher than the amount of energy consumed. The Dutch energy providers didn't dare to say words like: this is fake news. Their claim: the youngest generation of smart meters is better. So "only" a possible problem for the 850,000 households with the smart meters of yesterday. This morning an article in The Telegraph. Earlier this week the German press was not amused (Der Spiegel and the Frankfurter Algemeine Zeitung). Silence in the French press, too busy with the presidential elections and PSG after the Barcelona defeat. On the website of the French consumer organisations one comment so far, from my keyboard as Robert Dumoulin. Let’s wait and see if Mr. EDF and Mr.ENEDIS deem it necessary to react and defend their love baby LINKY as soon as the real French journalists wake up. Does the new meter have a digital reading to 'read'? Are there any instructions on how to use? We are buying a house with the linky already installed. Don't you worry, there is a display, and a manual, in French. For the three-phase meter this manual. A special service from ENEDIS for their clients from abroad, English LINKY instructions for the single-phase meter and also for the three-phase meter. The French press – la Tribune and le Figaro – starts asking questions about Linky, taking note of the smart meter study in the Netherlands. ENEDIS and the producers of Linky have reacted, see this press release. Summary: the findings of the Dutch study cannot be generalised to LINKY, because these meters use a different measurement technology. Not a Hall effect sensor or Rogowski coil, but a low value shunt resistor (single-phase) and/or a special transformer (three-phase). And because LINKY conforms to all the relevant regulations. This is of course reassuring news. If independent research can confirm these claims it would make the LINKY rollout easier for ENEDIS. The predecessors of the smart meter - disc type and the electronic Sagem meters with lcd display ( http://up.picr.de/31267471bg.pdf ) - don´t have a switch or anything else capable of shutting down your supply. The new LINKY meter has, deep down under it's green plastic jacket, a switch triggered by clever electronics. No external old fashioned switch in sight. Only two push buttons ( http://up.picr.de/31237473sk.jpg ). Our new Linky has already forced me to upgrade from 6kVA to 9kVA on our three phase system. Previously we got away with a 2kVA kettle and 1.5 kVA (wired as 3 phase) running together. After the Linky was installed I needed to reset the system after the inevitable 0.5kVA overload detection. That's about 20 Euros extra p.a. !! At least the Linky is indoors and easily accessible. I also like the information available and that it is read remotely. Thanks for all the detail about its operation. Alistair, may I take this opportunity for a word of advice for others where ENEDIS is going to fit the new Linky meter. Having a three-phase supply has always been a bit more complicated than single-phase. Because it is not too difficult to overload only one of the three phases - your puissance souscrite devided by three - and trigger the overload threshold of your main switch or the fast electronic power limiting of Linky. Switching off everything, not only one phase. With a single-phase supply you have much more "headroom". So why not consider the possibility to make the switch to a single-phase supply, easier to live with. A second remark: if the necessary telecom infrastructure is in place, only then you will benefit from the smart meter reading capabilities of Linky. So one should not be surprised to receive a letter from EDF/ENEDIS asking you to continue to let Mr. Meterman have a look at your meter or continue with your own meterman activities online in your EDF espace client. The telecom infrastructure is still under construction and has been an Achilles' heel right from the start. Seven years ago already under discussion. 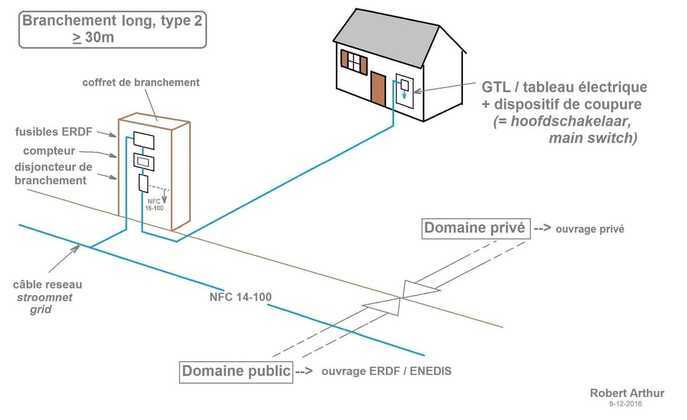 There is a long story about the choice of three phase for our house related in the main to our position at a remote site. Here is the short version! The original supply was single phase which dropped from 230V to 180V under a modest load which EDF agreed was out of spec and their cables needed a full upgrade over a distance of about 1km. They agreed to meet the whole cost but said there would be a delay. I thought the delay would be infinite so went ahead with a three phase rewire to alleviate the problem. Two years later we arrived at the house to find the promised upgrade was underway. It comprised 25 huge concrete pylons, our own transformer mounted 400m up the lane, new quad, high capacity cable and new fittings to the house. One other household had a new connection from the transformer. We could revert to a single phase connection which I could set up but not without some costs. At the moment we will continue with the existing system, including the three phase Linky. On the subject of communications, it seems we are lucky enough to have the required infrastructure. Our recent bill corresponded exactly to my reading of usage from Linky and nobody has visited us. This "smart" feature is confirmed by changing from 6kVA to 9kVA by phoning the English speaking EDF number while in UK. He checked that he could communicate wth our Linky and completed the operation while I waited for a few minutes on the phone. It is true that we are paying 20 euros extra per annum and we must still be careful about our balanced loading but it saves me a few days judicious modification and the associated costs. Our Linky would have to be changed as well. Overall I expect to avoid any more work and stick to the status quo. I appreciate that your wise words of advice should be heeded by anyone without good reason to have a three phase system. Never a dull moment. Another disadvantage, power limiting. No, not the nervous reaction of Linky seeing a very small overload. This time about real overloads. Once upon a time changing your puissance souscrite from let's say 6 kVa to 9 kVa needed a manual intervention by a technician, opening your disjoncteur de branchement (DB) and pushing a slider in higher gear. Those days have gone: it's now up to Linky to set a limit to your maximum power. The DB is still there, but only with it's 500 mA differential RCD function activated. 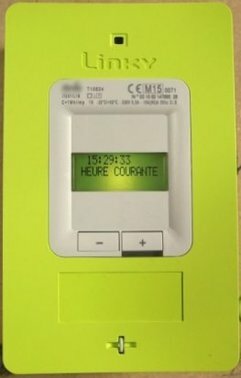 Linky can be switched into higher gear by a mouse click somewhere at HQ EDF/ENEDIS. Nobody to check in what condition your cables are in, no check by a technician. In the case of a " long connection" to the grid too high a setting could be dangerous if the existing wiring is too thin for these higher currents. I wished I had discovered this, but it is Promotelec - with EDF, ENEDIS, Consuel and many important others in the supervisory board - with a recent warning asking the attention of the happy owners of a brand new Linky smart meter. A dumb design flaw.